There are, on any given night in Los Angeles a jazz group playing somewhere in the city. Not being the Jazz city it was known for in 50,60s and even The 70s, L.A. has learned to “settle” for whats popular or what feels cushy and commercial. 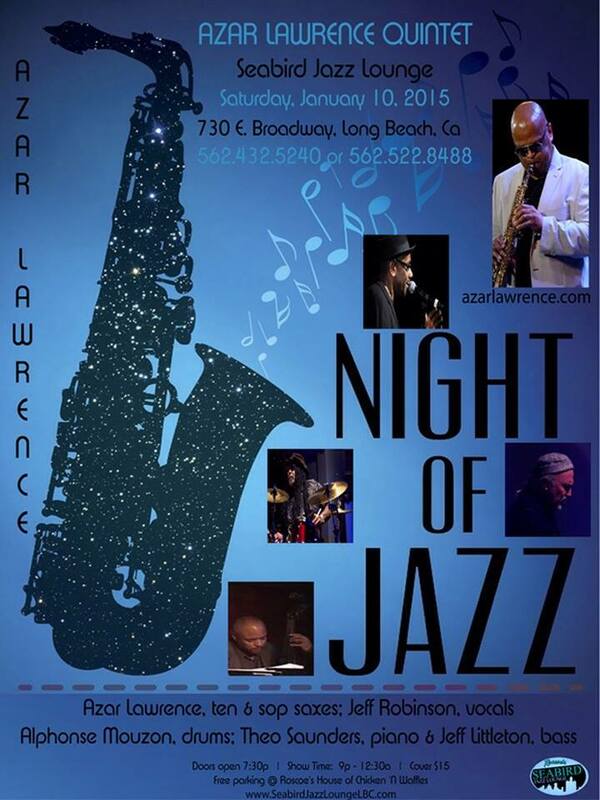 Well Saturday night at 9pm,January 10, there will be no cushy, “commercial pabulum’ pouring on the bandstand at the Seabird Lounge in Long Beach,California, One main reason is because a major iconic group will be performing ,The Azar Lawrence Quintet. Azar a throwback to the days when guys played the whole tenor saxophone , not just the upper register while circular breathing. Lawrence is known for his contributions as sideman to McCoy Tyner, Miles Davis, Freddie Hubbard, and Woody Shaw. Lawrence was the tenor saxophonist Tyner used following John Coltrane’s death. I personally saw him perform with Alice Coltrane at the famous jazz spot, The Lighthouse in the early 70s, he was not quite 21 yet. Previous Post HIPSTER SANCTUARY RETRO-JAZZ REVIEW:CAL MASSEY – BLACK LIBERATOR?? This sounds like it’s gonna be a tremendous treat for the disciples of the era. Really wish I could be in attendance. Use to frequent the Broadway area when I lived in Belmont Shores back in the day.